What went wrong with Turkey’s referendum? As illiberal democracy is becoming more the norm than the exception in the world, Turkey’s referendum is another missed historical opportunity. Supporters of AK Party near Taksim Square, Istanbul. Picture by: Depo Photos/ABACA/ABACA/PA Images. All rights reserved. Turkey has missed an historical opportunity to prove that liberal democracy could work in a Muslim country. On Sunday, the 16th of April, over 50 million people voted in a public referendum and approved a constitutional change leading to a stronger presidency with extended powers. The voters had two options in the ballot boxes for an executive presidency (Cumhurbaşkanlığı sistemi): Yes or No. Results released by the state-run Anadolu Agency were that 51.4% voted ‘yes’ to change Turkey’s political system from a parliamentarian democracy to a presidential one. In the three largest cities – the capital Ankara, Istanbul and Izmir – as well as in the mainly Kurdish southeast Anatolia, the majority said ‘no’. The main opposition parties, the Republican People’s Party (CHP) and the Kurdish People’s Democratic party (HDP) are preparing to contest the results within the period of objection. There is one clear result after the referendum: Turkey is a deeply polarized country with a bitterly divided nation. Polarization has always been part of Turkish society but has never been as visible as it is now: pious and seculars; Turks and Kurds; Istanbulians (Istanbullular) and others, Europeans and Anatolians; and most recently women with and without headscarves, are the best examples. The rift between secularists and Islamists has become the main fault-line in Turkish politics under the AKP (Adalet ve Kalkinma Partisi, Justice and Development Party) rule. Post-referendum controversies indicate that the AKP miserably failed ‘the test of democratic change’ in a Muslim country. According to Erdoğan, the change now opens the path to a much more rapid development so that Turkey will become a more democratic, secure and stable country. Many of us doubt this. There is no question that the current constitution, which was accepted after the military coup of 1980, needs to be amended but not in an illiberal way. I argue that the changes in the constitution embody the illiberal democracy of AKP’s political Islam and nationalist authoritarianism. Turkey is a country full of paradoxes and contradictions. When the pro-Islamic AKP first came to power in 2002, Turkey was seen as a shining example of a secular democracy in the Muslim world. The AKP has ruled the country since then. Under Erdoğan’s leadership, it has achieved an exemplary economic development, tackled with ‘a state within a state’ (deep state) bureaucracy and clamped the military’s power while engaging with a peace process with the Kurds during the early days of the AKP governance. In 2017, none of these achievements is sustainable. Turkey is no longer a country governed democratically. Within the last 94 years of its modern history, Turkey has suffered from military coups almost every decade, including the failed attempt of July 2016. The debates on changing Turkey’s political system to an executive presidency also had been on the agenda since the 1970s. Turkey’s previous presidents Turgut özal and Süleyman Demirel, who both had direct experience of military coups, initiated the debate that a presidential system similar to the US could address the ‘compelling issues’ that haunted the country for decades. We still do not know who was the mastermind of the failed coup attempt but Erdoğan points to the Islamic cleric Fethullah Gülen, who participated in Turkish politics in the 1970s and lives in exile in the USA since 1999. Within the last nine months, around 50,000 people have been arrested and over 100,000 state officers were fired because of presumed connections with the Gülenist movement. The country is governed under a state of emergency with fear and an ongoing purge. Following the debates of özal and Demirel, President Erdoğan put the idea of change to a presidential system into practice. The crucial step was taken earlier in 2007 when the Turkish constitution was modified to have a public referendum on the presidency, but the failed coup attempt in July 2016 has acted as a catalyst for change. For Erdoğan, the change is essential to protect not only democracy from shadowy forces within, such as the deep state and the Gülen supporters, but also the unity of the country and the ‘Turkish nation’ against the outside security threats of the Islamic State jihadists and the Kurdish separatist groups in the Middle East. The irony is that both Erdoğan and his opponents argue in the name of protecting Turkey’s national interests and democratic future. Since the transition to a multi-party system in 1950 Turkey has been on a trial whether or not a western type of democracy can be consolidated in a Muslim country. As argued in some of the literature on the subject, “in the west, democracy has meant liberal democracy - a political system marked not only by free and fair elections, but also the rule of law, a separation of powers, and the protection of basic liberties of speech, assembly, religion, and property”. Despite ‘free and fair elections’, Turkey is no longer governed by the rule of law: it holds the highest number of journalists, academics, judges, and lawyers in jail since the failed coup of July 2016. Turkey’s main problem is the poverty of its democracy in a deeply polarized society. Secular, leftists and Kurdish groups not only said ‘no’ to the presidential system but have also voiced criticism saying that Turkey has never been a fully-fledged democracy with the protection of basic liberties. Although Turkey’s current political system is imperfect, nevertheless political power is not concentrated in the hands of one-man because checks and balances operate through the separation of powers: the head of government (the prime minister) and the head of the state (the president) are two different people; the president is neutral without any political party ties and role; the executive branch of the government derives its legitimacy from its ability to command the confidence of the legislature; the power of two branches (executive and legislative) is balanced by an impartial judiciary. The separation of powers is protected by the constitution. Historically, constitutions are essential to establish the rules of a social contract as to how power is exercised within the state. In general, constitutions evolve to reflect the progressive change of societies but, unfortunately, this trend is going backwards in Turkey. The package of 18 constitutional amendments has passed to abolish the post of prime minister; the president can keep ties with political parties, have the authority to draft the budget, declare a state of emergency; and will issue decrees to appoint ministries without parliamentary approval. More importantly, the impartiality of the judiciary branch suffers the most, as the presidency will have broad authority over the high council of judges and prosecutors. All these changes lead to the concentration of political power in the hands of one individual, president Erdoğan, with weakened checks and balances. In short, by eliminating the separation of powers and the impartiality of the judiciary, these changes reverse Turkey into illiberal democracy and increase Erdoğan’s authoritarianism. For some of us, this was an expected result given the fact that ‘illiberal democracies have become more the norm than the exception’ in many countries with different cultures and religions. Erdoğan’s authoritarianism is not a new type of political Islam and but old school nationalism combined with illiberal democracy, just like Putin in Russia and Modi in India. Erdoğan’s authoritarianism has nothing to do with Islam but uses religion supported by the ideology of Turkish nationalism. The main obstacles blocking Turkey’s democratic path are set up by the founding paranoia of the state about its enemies outside and its distrust of ethnic minorities inside. This nationalist tradition has been ruling the country, both in the name of conservatism and religion. In practice, Erdoğan has been in power for the last 14 years and mastered the paranoia of inside and outside enemies by using nationalist and anti-western discourses. The referendum was about confidence in Erdoğan. One of the crucial changes that Erdoğan promised in October 2016 after the failed military coup is reinstating capital punishment. As one of the pre-conditions of its EU membership, Turkey abolished capital punishment legally in 2004. The AKP government promised to present a draft law reinstating the death penalty in Turkey and Erdoğan promised to approve it immediately after the referendum. It is a response to the nationalist and populist protests calling for the hanging of Fethullah Gülen and the jailed Kurdish leader Abdullah öcalan. For Erdoğan, it will send strong messages to Turkey’s enemies inside – Gülenists and separatist Kurds – and the enemies outside which he describes as the west’s ‘crusader mentality’. On the contrary, for his critics, this will widen the gap in a peace process with the Kurds. 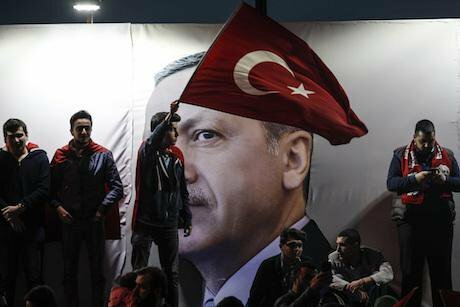 For Turkey’s EU membership, the abolition of capital punishment is a red line. Turkey has never been further away from its European path in its history and will reverse faster into illiberal democracy. There is no doubt that authoritarian nationalism and populism continue to leech on the weaknesses of majoritarian politics. The 51% majority of voters decided to allow Erdoğan to remain in power possibly as late as until 2029, in other words being ruled by the same leader for 30 years, as it was under the Ottoman sultans. Moreover, majoritarian politics is a double-edged sword in a marginally divided country, like Turkey. Will Erdoğan continue to polarise the society, oppress the opposition and ignore the other half of society? Within the next two years, in November 2019 and probably earlier, presidential and parliamentary elections must be held. Once again, the majority of people - Turks and Kurds - will have time to observe how Erdoğan will use his extended powers in the coming months. In other words, a lot is at stake under the one-man rule for Turkey’s future, including for Erdoğan himself. The question is whether Turkish society has reached a level of maturity to distinguish liberal democracy from illiberal one or not.